When evaluating young talent it can sometimes be difficult to rate the potential size and ability of 6th, 7th, 8th graders coming up. One such 2019 prospect out of Wisconsin who has some excited about is future is F Xzavier Jones. The 7th grade standout is part of a young and talented group of middle school prospects on the way up in the Badger state. Jones is long 6-3 forward with an excellent frame and improving skill package that makes for a very intriguing young talent. While watching Jones compete, it’s easy to see the frame and length he hosts as well as the coordinated athleticism he also displays on occasion. The young phenom has good leaping ability, plays under control and has shown to be very coachable, constantly taking advice and working on his game with excellent discipline. He understands the game well and rarely makes a mistake twice without finding a way to correct it and make the play the next time the opportunity is there. Skill-wise, Jones has a good arsenal built already, where he can play opponents down in the post with his back to the basket and turn and score going to the hoop, or he can play away from the hoop and knock down jumpers with solid accuracy from 12-17 feet. His strength with the ball as well as his vision on kick-outs and outlets has also come a long ways and he continues to develop ball-handling skills that help him taking it to the hoop against slower defenders. Defensively, the 6-3 seventh-grader is figuring out he can affect the game in a variety of ways down low, be it locking down and keeping his man off the block with his leverage, disrupting shots attempts and passes with his length and activity, and sniffing out block opportunities without getting out of position or in foul trouble. Further, Jones has become more of a dominant force on the boards as he’s started attacking the glass more and is stronger coming down with it, clearing his space and pushing the ball to guards in transition. 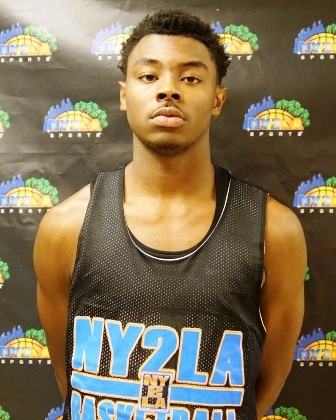 There are a lot of positives in Xzavier Jones’ game right now and he seems primed to make a statement at his level and in any competition he comes across as he does not shy away from adverse situations, loves having the ball in his hands in clutch moments, and he has developed his strength and coordination nicely the last few months. As upside goes Jones has plenty of it and with continued hard work and development the young Milwaukee native stands to deliver lots of impressive performances in the coming years as he continues to improve both physically and skill wise. He plays with the Playground Elite program during the grassroots travel season.